PlanetCare Solar is dedicated to bringing about a cleaner, greener Australia by utilising the gift nature has given us, our many hours of sunshine. 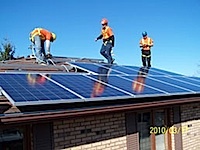 PlanetCare Solar is a specialist in the design, supply and installation of high quality low cost solar energy systems for residential South East Queensland. From a 1.5kw solar energy system to a 10kw solar energy system with either roof mounting or ground mounting systems, we are equipped with the finest solar panel products. panel mounting systems and solar power inverters from the largest and most successful group of renewable energy manufacturing companies across Europe, Asia and the Americas. Our engineers, designers and installers are world class, certified and able to complete any project. If you are shocked by the incredible rises in your electricity bill year after year or you are considering a solar energy system for your home to lower your carbon footprint, chat with our solar specialists about your requirements. Our highly trained specialists are leaders in the field of residential solar energy systems. book a free site evaluation and consultation.